Dr. John Rabkin helped to develop a method of using the laparoscope to perform this procedure, called LapDS, resulting in smaller incisions, minimal scarring, less discomfort, faster recovery and a shorter hospital stay. Dr. Rabkin specializes in this advanced procedure, and has one of the largest series of LapDS patients in the United States. The laparoscopic duodenal switch achieves an average loss of 50 percent of excess body weight at six months and 90 percent at two years. In a duodenal switch, the stomach is reconstructed into a cylindrical tube, which allows more room for food compared to purely restrictive bariatric procedures such as LAP-BAND® surgery in the Bay Area. This permits an eating pattern and diet that is much closer to normal than those required with other weight loss surgeries. LapDS leaves the pyloric valve intact, which regulates the release of stomach contents into the small intestine. This procedure also keeps a small part of the duodenum -- the first part of the small intestine -- in the digestive system, which is important for mineral absorption. The malabsorptive component of LapDS surgery involves reconfiguring the small intestine to separate the flow of food from the flow of digestive juices. The food and digestive juices interact only in the last portion of the intestine, so much of the consumed food -- particularly the fat -- passes through the shortened intestines undigested. This means fewer calories are absorbed from the food you eat. Unlike the restrictive component of the surgery, the intestinal bypass component is reversible for those patients who may require it in the future. 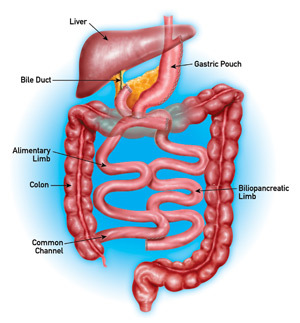 What is the difference between LapDS and Bay Area gastric bypass? The main difference is that the duodenal switch patient is left with a more natural configuration of the stomach and small intestine. Roux-en-Y bypasses the pyloric valve and the duodenum and connects the stomach pouch directly to the small intestine, which can cause Dumping Syndrome. Unlike Bay Area gastric bypass, LapDS leaves the pyloric valve and part of the duodenum intact, connecting the stomach to the small intestine below the duodenum. This keeps the upper portion of the digestive process essentially the same as before surgery. The pyloric valve regulates the emptying of the stomach contents into the duodenum, and the duodenum continues to secrete digestive enzymes and hormones and absorb minerals. Why haven't I heard more about LapDS? While many well-known bariatric procedures have been around for decades, LapDS is a more recent innovation in weight loss surgery. LapDS is performed by fewer than 50 surgeons worldwide, so it is not as widely publicized as other procedures. What if my doctor doesn't perform the LapDS procedure? Due to the intense level of training and specialization it requires, the LapDS is not offered at most weight loss surgery centers. However, Dr. Rabkin treats patients from across the country, and the staff at Pacific Laparoscopy can provide travel advice to make LapDS available to you. If you would like to find out more about duodenal switch weight loss, click here to request a consultation with Dr. John Rabkin at Pacific Laparoscopy. Or you can call our office at 415-668-3200 to schedule your appointment.